Right in the center of the western German border is located the town of Aachen, famous for its magnificent cathedral, known as the Imperial Cathedral. 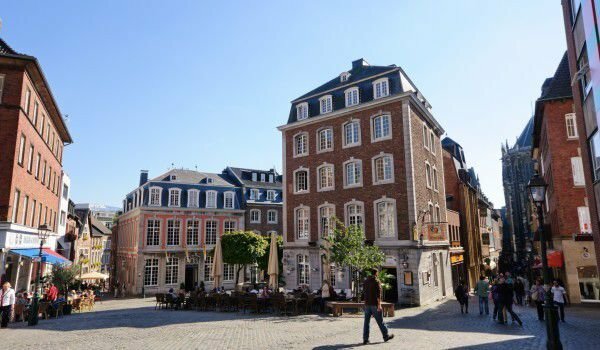 Aachen is situated near the border of Germany, Belgium and the Netherlands, in North Rhine-Westphalia, about 65 km west of Cologne. There are about 260, 000 people in the city, which is an important railway junction with coal mining, engineering, textile and glass industries. Furthermore Aachen is known as a University Center - here is one of the best technical universities in the country. Separately, Aachen has a tradition of balneology. Aachen has different names in different languages. The Italian name is Aquisgrana, and Spanish – Aquisgron, derived from Latin. In German, it is Aachen and in Dutch- Aken, a name related to the local spas and the French Aix-la-Chapelle makes reference to the former palace chapel, St. Marien, which later became the cathedral in Aachen. The mineral springs here are the reason these lands were inhabited in antiquity. The Romans gave it the name Aquae Grani or Akvus-Granum (Aquisgranum) in honor of the Celtic god Grannus, which is celebrated as the patron of the healing power of mineral water. Even in Roman times, water from hot springs of the village had been channeled into baths, some of which are still used today. The earliest evidence of Roman settlement here come from the 1st century, but the Aachen region has been inhabited since the Neolithic age. This is evident in the ancient quarry opened near the city. The large settlement, however, develops only in the Middle Ages. In the 8th century Aachen was the residence of the Merovingian’s. Around 765 the village was under the rule of the Frankish king Pippin, who was the father of the future Charlemagne. Charlemagne himself chooses Aachen for his winter residence and built the palace here in 778. Unfortunately it no longer exists, but the church built by Charlemagne and his relics stores remains one of the great sights of the city. From 936 to 1531 in the cathedral in Aachen is carried out the coronation of the kings of the Holy Roman Empire. Built in 805, the cathedral in Aachen today is part of the list of World Heritage Sites by UNESCO. In 1748 the city signed a peace treaty after the War of Austrian heritage. From 1798 to 1814 in Aachen is a French possession. In the early 19th century, it became part of Prussia. During the Second World War, Aachen is literally leveled to the ground as a result of the bombing, but is considered the first German city liberated from Nazi rule. A sightseeing tour in Aachen invariably starts by the Imperial Cathedral. Aachen is forever the favorite town of Charlemagne. Initially attracted by the mineral springs, the ruler made the settlement his capital. In his palace was based the School of Fine Arts. In the 14th century Charles IV ordered the making of a golden bust of Charlemagne, crowned with the golden crown of Charles IV, which today can be seen in the Cathedral Treasury. At the core of the cathedral in Aachen stands Pfalzkapelle- the palace chapel of Charlemagne from 800 AD, consisting of an octagonal central part - the oldest in Northern Europe. According to legend, when they open the tomb of Charlemagne around 200 days after his death, he was found in surprisingly good condition - sitting on a marble throne, with a crown on his head and with the gospel in his hand. In 1165 Emperor Frederick Barbarossa was working hard on the announcement of Charlemagne as a saint, then the chapel became a popular place for pilgrimages. At the same time the ruler remains closed in the marble sarcophagus of Parma, and in 1215 Frederick ll, buries them in a coffin of gold and silver. Becoming a popular place for pilgrimage, the cathedral in Aachen expanded and is now popular with its "glass chapel" of 1414. Domschatzkammer keeps some of the most important religious valuables in Northern Europe – the Persephone sarcophagus, the bust of Charlemagne and the cross of Lotar. Other notable building in Aachen today is the building of City Hall, built in 1334-1337 on the site, where the royal palace burned. The only preserved part of the palace of Charlemagne was the East Tower (Granusturm), which is upgraded, to become the largest bell tower in Germany with 49 bells covering four octaves. City Hall undergoes renovations, passing through a Gothic, Baroque and finally Neo-Gothic architectural style. Not far from the center of Aachen can be seenthe preserved gates (Marschiertor and Ponttor) and the tower Langer Turm, which are parts of old walls. In Aachen is held annually an international competition for riding - CHIO, which is considered one of the most prestigious in the world and can be compared to Wimbledon in tennis. The Technical University of Aachen was founded in 1870. Today it is a center for technical research of world importance, mainly in the fields of electronics, mechanics, computer science and physics. The University has a clinic that is the largest hospital located in one building. The University of Aachen is surrounded by a makeshift town of computer and software manufacturers. Aachen is still functioning as a resort thanks to the water from hot springs at Aix-la-Chapelle, which contains a significant concentration of common salt, other salts and sodium sulphate. Among the culinary specialties of the city is a kind of hard local sweet bread that is baked in large, flat pieces, called pinten.